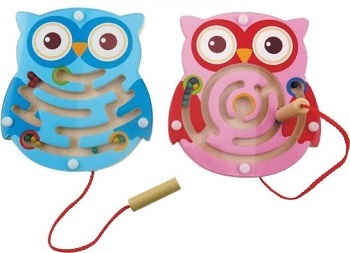 Use the magnetic wand to pull the beads through this adorable maze! 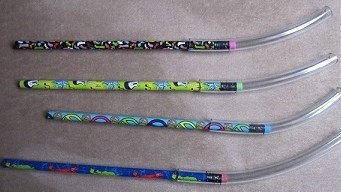 Encourage the development of pencil grasp, hand-eye coordination and motor planning while enjoying a challenging task! Take all the beads to one spot or match the colour of the beads to their appropriate "home". Small size is good for portability. 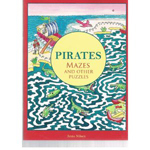 Beautiful, colourful mazes and puzzles in two great books, one with a pirate theme and the other featuring wizards. Diving Dolphin is a great bilateral manipulation activity that promotes the development of finger isolation and pincer grasp, visual tracking skills, bilateral integration, and finger strengthening. 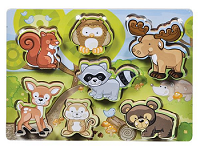 Young children will love this adorable chunky wood Barnyard Animals Jumbo Knob Puzzle by Melissa & Doug. Puzzle pieces have large easy-grip knobs that are easier for little hands to hold. It features 3 farm friends (cow, horse & sheep) with full-colour matching pictures underneath. Follow The Leader is a great bilateral manipulation activity that promotes the development of finger isolation and pincer grasp, visual tracking skills, bilateral integration, and finger strengthening. 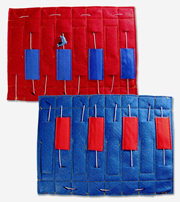 The Rocker Board with marble maze improves balance and coordination in an amusing format. A great way to develop bilateral coordination, motor planning, and shoulder strength and stability. 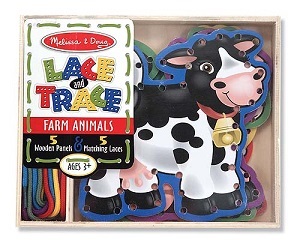 These colourful lacing set offers a variety of farm animals. This colourful lacing set offers a variety of animals. "I can do it myself!" Few things will give your child more satisfaction than mastering shoe lacing and tying skills.